The seventh installment in the controversial Grand Theft Auto series – one of the most popular game franchises in history that brought Rockstar Games company international fame. Another installment of one of the most popular and controversial game series of all time, in which the player is offered an opportunity to play as a minor thug, and then engage in criminal activities to take the lead over the Mob. This time you play as Carl Johnson, who a few years ago escaped his hometown in pursuit of a better tomorrow. After five years, Carl returns to Los Santos, where he finds a criminal underworld full of murder, drugs, and corruption. However, the unpleasant situation in the city is not the end of bad news; the district where he grew up looks worse than five years ago, and his feuded family mourns Carl’s murdered mother. On top of that the protagonist gets framed for murder by corrupt policemen. Welcome to California of the 90s. The game world consists of State of San Andreas, along with three cities: Fierro (San Francisco), Las Venturra (Las Vegas) and Los Santos (Los Angeles), where the player can move around. Of course, San Andreas is not made of slums only; apart from that, the metropolises also consist of rich districts, where movie stars, politicians, and millionaires live. So there are enough people to steal from, which Carl is well aware of. What is more, he does not have to perform on his own, as he can recruit people to his gang. Being able to ride and wander around in a group creates many opportunities to engage in fierce battles with rival gangs (e.g. the player is driving a car, while the passengers shoot enemies with machine guns). 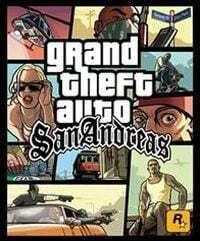 The game is kept in the atmosphere of the 90s, and the fantastic graphics (realistic fog and light reflections on cars as well as realistic shading) and the music, seem to be nothing next to other novelties that were introduced to GTA: San Andreas as compared with previous installments of the series. The most significant one is probably the introduction of hunger. Feeding the character, however, is not all – the hero may e.g. gain weight through excessive eating. Moreover, you can lose weight, by regularly visiting the gym and doing more sports. Another thing that increases believability of the game world is improved interaction with buildings. Burglary is an important feature of the game – you need to carefully plan one and carry it out yourself. You can also purchase various apartments that can make money for you. E.g. there is a casino where you can spend some cash. Each city has a size comparable to the whole world of GTA: Vice City, so there is no shortage of various means of transportation that prove to be essential for traveling hundreds of kilometers. Typical vehicles, such as cars, motorbikes, speedboats, helicopters, and airplanes, were joined by the good old bicycle. Apart from driving, Carl Johnson is also able to dual wield pistols, as well as swim – which is at the same time one of the biggest innovations in the game. Visiting the cities of San Andreas is a great experience not only because of fantastic graphics but also thanks to the intelligence of citizens, who are able to react to your unethical behavior in public, or call you a fatty if you have been overeating. In order to feel the atmosphere of each GTA: San Andreas city the developers, as they admit, personally visited every one of them, and in the game they applied their unique atmospheres. Despite the gangster theme, GTA: San Andreas introduces a dose of humor to the story, thus making it a must-play game for both fans of the series and those who are not yet familiarized with the world of GTA.